T3 joins French President, François Hollande (briefly), on a tour of Angers' state-of-the-art facility, to find out why France is leading the way in the Internet of Things (l´Internet des Objets). Turns out, it has a lot to do with a kind of Teletext-with-knobs-on (Minitel), and a rabbit called Nabaztag. 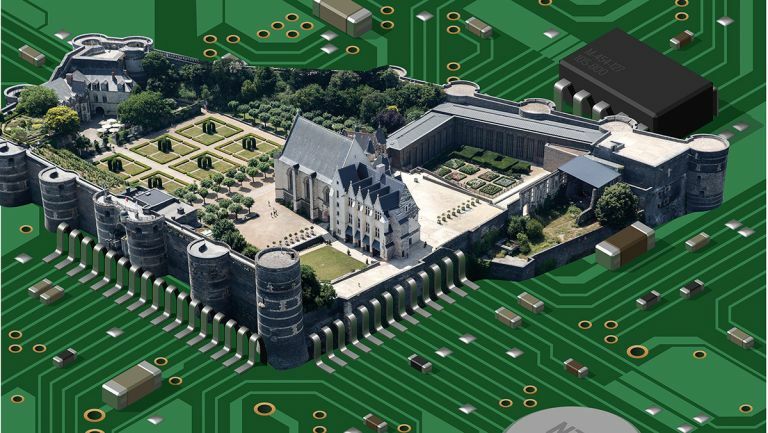 From its dominating 13th century castle walls and medieval street plan, Angers, France doesn't feel like your typical tech hub, but with the inauguration of the Cité de l'Objet Connecté, a facility devoted to commercializing connected products, the historic town finds itself at the epicenter of tech's latest boom industry, the Internet of Things (IoT). There's everything from Withings' eco-system of devices for tracking your sleep, your home's air quality and your weight (whilst telling you the weather) to Netatmo's face-recognising IP cam, to all the delights unveiled at Paris' Connected Conference. The Cité is an impressive 2,000 m2 incubator, or seed accelerator, or whatever you prefer to call a building filled with 2.1 million euros of high-tech equipment put there to help up to 170 entrepreneurs get their prototypes into production. It's part of the government's grand plan for a 'New Industrial France' and the brainchild of Eric Carreel, founder of Withings and something of a hero in French Tech. Any Brits who haven't yet come across a Withings health monitor, will know Monsieur Carreel's work from the ubiquitous Wi-Fi hub that he designed for BT. After hosting president Hollande, Carreel showed us around the tech hub where 3D printers and industrial lathes were being primed by a trained staff of around forty experts ready for the first projects to arrive at the Cité de l'Objet Connecté. Funded by the government and local tech firms such as Éolane, the idea of to provide the tech, tools and expertise needed to turn an idea into a working prototype that could be produced locally. Serial entrepreneur, Careel notched up some early IoT hits with innovations like the Withings Body Scale, that sends your BMI data to be interpreted by a helpful companion app. Later he founded Invoxia to launch the Smart Office Phone that linked your smartphone and landline. We asked him why France is leading innovation in the Internet of Things. The support here in Angers is certainly strong, but Liam Boogar, the editor of Rude Baguette, a blog about French startups suggests that Minitel is another explanation for the French connection. Born in the silicon valley, Boogar now writes about the lively French tech scene (in English) from Paris. He puts it simply: “Basically, France had the intenet first”. Minitel was effectively the France-Wide-Web. Rolled out by the then state-owned France Telecom back in the 1970s, it connected virtually the whole country by 1982 offering online services before the web showed up. Liam Boogar has more explanations for the French lead in the IoT. “You have a lot of talent in the right fields here. Software is mathematics and from Pascal and Descates there are always great mathematicians here. And you have luxury design too, which is crucial in creating a successful electronic product." So when did the French movement begin? Well CES 2015 at the beginning of the year certainly had a very Gallic flavour. France stormed the Las Vegas Convention Centre with no fewer than 66 startups (second only to the US) and the largest European delegation, with four French brands winning CES Innovation Awards. But cast your mind back to 2005 and you might remember Nabaztag, One of the earliest IoT products to go mainsteam, this French creation was a rabbit-shaped device that could read out weather reports in English and French. His most recent project bears a passing resemblance to the famous rabbit, but Mother, by a startup called Sense, is rather more sophisticated.Using separate sensors, called Cookies, it can measure can measure movement, temperature and noise etc in order to remind you to take pills, or trigger an event when a family member returns home. Mother basically acts as a hub, collecting data from the Cookies and sending it to your smartphone app. It hasn't been a commercial success in the US, admits Haladjian, but Mother is a great example of kind quirky innovation that is keeping France at the leading edge of product design when it comes to the technology industry's home front, otherwise known as The Internet Of Things.